Are You a Revenue Cycle Hero? Revenue cycle leaders are the unsung heroes of every healthcare organization. Optimizing revenue cycle management requires that you deliver super hero level effort each day, to achieve the financial results necessary to fund the clinical mission. The purpose of this eBook is to provide the ideas and guidance necessary to help you superpower your revenue cycle and achieve the financial outcomes that are critical to your organization’s success. 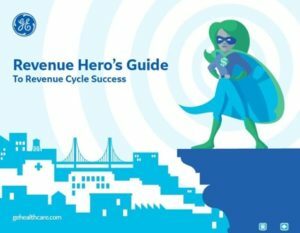 The Revenue Hero’s Guide to Revenue Cycle Success, shares strategic thinking, and provides real-world ideas and best practices you can implement in your own organization, to make a difference for healthcare and your bottom line. Revenue cycle heroes know that the revenue cycle is impacted by virtually every aspect of the healthcare continuum – from the time a patient makes an appointment until the time the bill is completely settled. An organization’s ability to proactively manage what happens in that period of time can have a direct impact on its profitability and future. It is becoming increasingly clear that to win in the battle of financial performance, organizations need to automate their revenue cycle operations as much as possible. Intelligent payment automation for healthcare payments – – the hero’s journey leads you right HERE, of course!